Consider a two rotor system as shown in Fig. (a). It consists of a shaft with two rotors at its ends (free ends). In this system, the torsional vibrations occur only when the two rotors A and B move in opposite directions i.e. If A moves in anticlockwise direction then B moves in clockwise direction at the same instant and viceversa. It may be noted that the two rotors must have the same frequency. Also at some point along the shaft, there will be a section of the shaft which remains unaffected by the vibrations. This section is known as 'Node'. We see from Fig. (b). 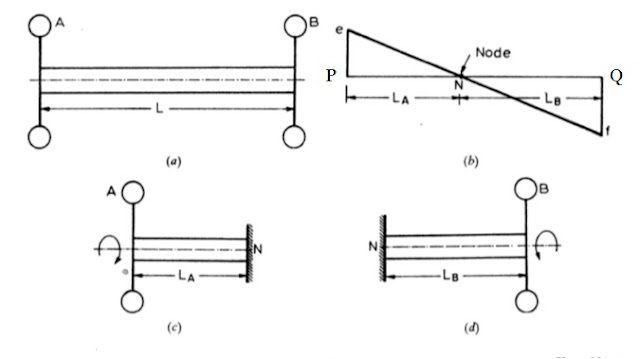 that the node lies at point N. The shaft behaves as if the shaft clamped at node and the two sections vibrate as two separate shafts with the same frequency but opposite in phase or opposite direction. Hence the sections NP and NQ can be considered as two separate shafts fixed at N as shown in Fig. (c) & (d). C = Modulus of rigidity for shaft material. From the equations (iii) and (vi) , we may find the value of and and hence the position of node. Substituting the values of lA or lB in equations (i) or (ii), the natural frequency of torsional vibration for a two rotor system may be evaluated. Note : The line eNf in Fig. (b). is known as elastic line for the shaft.